The Japanese maple tree (Acer palmatum) assumes a delicate and striking pose in your home landscape. It makes an excellent accent plant or specimen tree, its star-shaped leaves and horizontal branching habit creating an unusual and eye-catching addition wherever you choose to locate it. The tree does not require full sun, and, in fact, does best in a setting that receives plenty of morning sunlight, but filtered or partial sun during the afternoon hours so as not to burn or scorch the somewhat delicate foliage. For this reason, the Japanese maple can actually be planted as an “understory” tree, that is a specimen occupying an area beneath a much taller tree that casts partial shade onto the shorter-growing one. 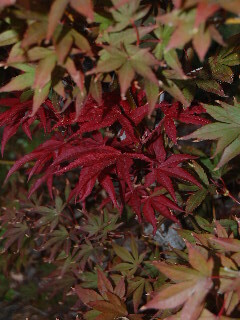 Depending on the cultivar you plant, the leaves of your Japanese maple will vary in color from the most typical green to different shades of red—the most notable among the red-leaved cultivars being the ‘Bloodgood,’ which produces and maintains its brilliant red foliage throughout the entire growing season. 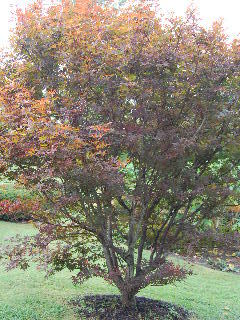 Being a deciduous tree, the Japanese maple, like the other species of maples (Aceraceae), drops its leaves in the fall, but not before making another colorful showing as the foliage turns to varying shades of scarlet, purple, yellow, or bronze—again, depending on the particular cultivar. In addition to some protection from the scorching afternoon sun, care must be taken to guard your Japanese maple from the drying effects of winds, as the trees are rather shallow-rooted. A year-round mulch of fine pine bark or pine needles helps satisfy the tree’s need for an evenly moist and somewhat acid soil. The Japanese maples are largely undemanding, requiring little fertilizer if planted in an organically rich soil and little pruning other than removing dead or crossed and rubbing branches from the interior of the tree. If you choose, the fine growth of small limbs and leaves may be removed from the lower main stems of the tree up to about halfway. This is the classic Japanese-style of pruning and exposes the tree’s unique branching habit, as well as displaying the attractive gray to sometimes reddish bark. There should be no need to prune the extremities of the tree, as this will take away from the highly desirable spreading shape the Japanese maple assumes on its own. Just be sure that, at the time of planting, you allow sufficient space for the tree to grow and spread as it matures. The Japanese maples are generally slow growing and long-lived. Some can reach heights up to 20 feet and more, and horizontal spreads equal to their height. Other smaller varieties can be grown in containers on your patio; some Bonsai plantings are often available as well. A Japanese maple can be a nice compliment to the area that surrounds your backyard water garden, or a striking shrub-like addition to the planting bed that adjoins your deck. The flowing and arching shape is much of what gives the tree its grace and dignity within your garden setting.